What to put on a business card? It’s a tricky question. A business card that contains just the right information (and a stellar design) will grab attention and help you stand out. It’s the thing that makes someone else remember you, or your pitch. Even in a digital age, a business card is a popular–and necessary networking and communication tool. Having a great business card provides legitimacy to your or your business, it’s a quick and easy way to exchange information, and can provide ways to help promote your work. What you put on your business card says a lot to others. Here’s a guide to what to put on a business card, with plenty of creative ideas to help you get started. No matter how you decide to create the design, every business card should include the basics. It almost goes without saying, but there are too many beautiful cards out there with no real information to identify the source. Equate this to an awesome website that loads slowly. You will just move on to something else. Something that tells people what you do – designer, photographer, web developer etc. Look for an image that’s sharp and easy to understand at a small size. A great photo can take an average business card to the next level. Leave a visual impression with new connections by using an image that shows what you do or your work on the card itself. Other ways to use creative imagery for a business card design includes using an image or illustration that shows what you do. Maybe you have a great “action” photo of yourself. Maybe you have a creative take on your job. Any stellar image can make an impression. The trick is to make sure it communicates exactly what you want to say visually. If your clientele needs to come to you, a cool, funky or artistically represented map could be a great reverse side of your business card. (You are planning to use both sides of the card for the design, right?) Plus, people just love to look at maps. Don’t get hung up on a map that has to show a precise location. The map should give users a general idea of where your business is located. Instead, opt for a striking visual that provides basic information such as city and state or proximity to a well-known landmark. Black and white business cards can be kind of boring. Create maximum impact with high color visuals that connect to your personal (or business brand) and personality. High color designs can work for any part of the business card design. One of the best tricks to make sure your card stands out is to use a thick paper with a color edge. Since most business cards will probably be on the thinner side (too many people do this to save a few bucks) and have a white edge. A thick card with a color edge will be a lot more memorable, screams quality and will be easy to find in those endless stacks of cards that get collected at professional conferences or networking events. While these effects are some of the most costly in this list, there are ways to avoid breaking the budget. Since a business card is a physical medium, make the most of it with something that users can see and feel. Opt for a textured effect such as letterpress or foiling. Use high-quality printing (not copying) for production so there’s a subtle raised quality to letters on the card. You can even look for a laser cutout or curved or nontraditional edges to make the most of a tactile design. The longer a user holds on to your card to examine these features, the more likely it is that they will have a stronger memory of it – and what you do. It’s an easy way to create a longer lasting impression. While these effects are some of the most costly in this list, there are ways to avoid breaking the budget. Print two types of business cards – one is a more standard design at a lower price point (use these in mailing and non-contact marketing touches), then have a second card with a premium design for top clients and meetings that you hand out in person. Try to use a similar visual design for each. There’s almost no design project where great typography isn’t a must-have element. With something as small as a business card, typography is vital to creating a design that people can understand. A common flaw in business card design is typography that’s too small. A good business card design has a typography hierarchy and structure just like any other project. Don’t be afraid to go big with important words such as your name or what you do. Use clean, easy to read typography. This is especially important if your name is uncommon or your business name or location includes difficult words or spellings. Make it easy for the user. Don’t cram your business card with too much stuff. 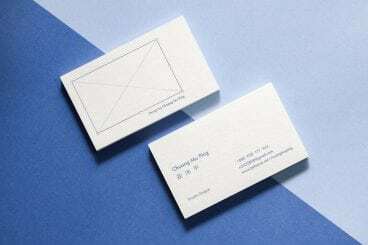 In addition to all the reasons why white space is good for the design, a bit of usable space can enhance business card usability. It allows the card recipient to make notes or write down information that they might need later. If this is something you see happening a lot, consider a matte or flat finish so that taking notes directly on the card is easy and so that ink does not smear. Physical elements such as business cards don’t come with the same measurable ROI or analytics that many of us are used to getting with digital products. Include a call to action or promo code for a product or service to help measure who is looking at and engaging with your card after a meeting. It’s not a surefire way to measure results – many people never redeem promos – but it can help you give users something in exchange for their time. An enticing call to action or promo can at the very least drive some traffic to your website or generate emails or phone calls, so why not try it out? Just because you need a business card, doesn’t mean you have to be boring. Make a great first impression with a strong business card design that lets people know who you are and what you are about. Use high-quality paper and printing techniques to solidify that impression. And don’t be afraid to get creative. In a creative field, your business card should not just tell people who you are; it should also showcase your style.